Mechanical problems made for a rough ride Tuesday night for some Metro riders. 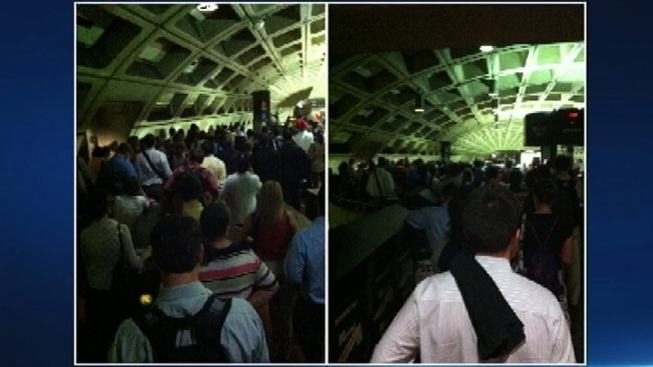 The above images show what it looked like at the Farragut West station Tuesday evening. Brake issues on one train and door problems on another made for big crowds one some Blue and Orange Line trains and platforms. Metro officials say delays lasted up to an hour. Some riders took their frustration to twitter, with one writing, "I am so glad I don't live on the orange line. Worst @wmata experience ever." Another wrote, "Bottleneck at the Farragut west metro station. Platforms so full they aren't letting anyone down the stairs. Should have stayed at work."